I'm going to be doing a number of posts about how to hang a painting. These will consider different aspects of what's involved in hanging a painting and hanging an exhibition. This first post will consider how to hang a picture frame using D rings - using two different approaches for different size and weight of picture - and includes images and videos to show you how to use D rings. If you find this post helpful please share it with your friends and/or share using Twitter or Facebook. D rings are a very common type of hanging hardware used by professional picture framers and also available to all artists via retailers in the high street and online (see below for links to some of these in the UK). They comprise a ring - in the shape of a letter D (hence the name) and a plate with a screw hole. D rings are always used in pairs - screwed into the back of the frame. They can have one screw hole or two. One hole is suitable for lighter works. As the weight increases (eg medium sized pictures) use a D ring with two screws for greater security. The ones most commonly used for small works are nickel plated. The type of screws used should be matched if possible to the type of D ring used. They are usually made of steel with a nickel or brass plating. The cheapest are zinc plated. The nature, composition and size of the D ring usually changes as the size and weight of the framed artwork increases. The plate part of the D Ring extends and the number of screw holes increase so that the load is spread. The location of the D ring on the frame also changes to ensure a secure hang. Much more suitable for framed artwork which is other than small. As a rule of thumb, if the size of my framed artwork is about the size of an A4 piece of paper or bigger I would always use a D ring. Enable the hanging wire or cord or chain to be threaded easily. There are basically two approaches to hanging using D Rings. Process Two - typically used for larger/heavier works of art - see tomorrow's post. Picture Wire or Picture cord - Both are suitable as they are created using several strands which are twisted together. They also do NOT stretch like ordinary string. AIM: Position the D rings on the vertical sides of the frame with the D on the inside (see image) and then string and fix the wire or cord between them. Decide where you want the D rings to be. Typically they are positioned no more than one third down from the top. 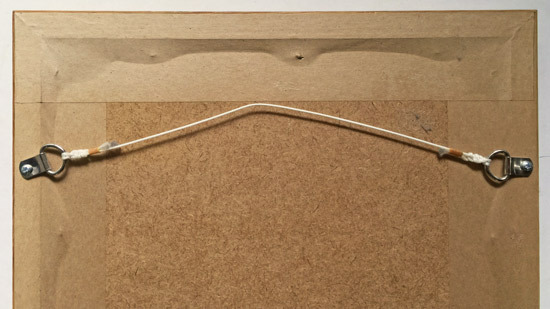 Drop (say) one or two inches below the top of the frame mark on the wall and fix an appropriate sized picture hook to the wall using hardened and/or steel pins (these make for a much stronger and secure fastening). If the picture is in a landscape or panoramic format you might want to use two picture hooks at approximately a quarter of the distance from the ends of the top horizontal. UK Picture Hanging Supplies - this site has the advantage of telling you which screws you need to go with them. 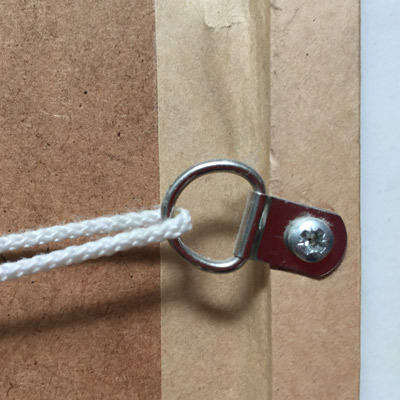 About.com | How to Hang a Painting with Wire and D-Rings (2011) by Marion Boddy Evans - this is a good step by step explanation with images - one of the vew few out there. The POLL: Exhibition frames: How much do you spend per frame on average? - and the responses and overview of the results How much do you spend on exhibition frames on average? 30 Apr 2011 - The reason I've chosen exhibition frames is because when we are framing for ourselves we can either put up with something very cheap or spend a lot of money.